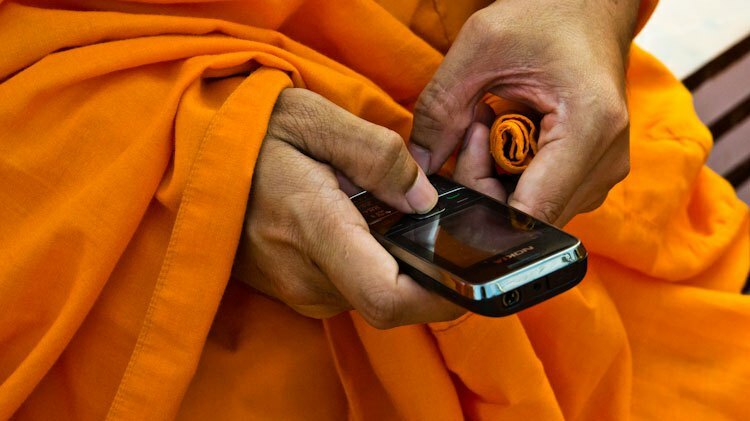 A graduating senior in our Department recently wrote a very nice blog post, for our Department’s site, on how disappointed a friend of hers, whom she had met while traveling in India, was when discovering a Buddhist monk using a cell phone. (Read her blog post here.) I posted a link to the article on a Facebook group devoted to the History of Religions — a group that, despite being some people’s preferred technical name for our academic discipline, has attracted a diverse membership. Someone in the group, having read the post, soon commented on how a monk with a cell phone was evidence of decay in religions. A travesty or smart marketing? My point: a lamentation on decay, in this particular case, is possible only if one already comes equipped with a nostalgia for origins that’s linked to such things as a world religions discourse, a distinction between religion and culture, a particular type of ahistoricity that presumes some elements of daily life are lodged in amber, etc., etc. — i.e., only if one comes equipped with a particular set of starting points that are, inevitably, alien to the object in question: a guy in a robe trying to stay connected. That we have no choice but to do this in making sense of the world is not my interest — we all have assumptions and starting points, and have no choice but to work with what what’s at hand. That we so often and so easily mistake our sense-making for neutral, disinterested descriptions of the world is, however, my interest. That we so frequently intervene in the worlds of the objects we study, adjudicating which is authentic and orthodox (Ramey had something to say on this, as I recall), is what we, as scholars, should be considering. Simply put, decay, like beauty, is in the eye of the beholder — just ask anyone who likes moldy cheeses.